Description: Train 856; headed for Mount Olive clears CP Roxbury. Description: HEY! It's a PL42AC on the Freight House Track in Gladstone. In this rare shot on a weekend with electrical power cutoff on the Branch, a PL42AC on a westbound train is taking the Freight House Track acting as a runaround track so the eastbound train may proceed to Hoboken. Description: 4023 pushing an uber-late train to Hoboken in Millington. Description: NJ Transit PL42AC #4023 running light leaves the Hoboken Terminal. Title: James Bond stoll NJT PL42AC #4023!! Description: NJT PL42AC #4023 comes to a stop with a conductor pretending to be James Bond. Title: "Yeah, this is MY locomotive." Description: The conductor seems to care about the saftey of this piece of crap. Description: The Bergen County Line 7-car train departs Hoboken with a solid set of Comet I's. 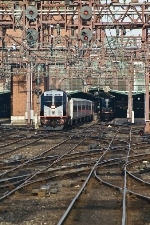 Description: NJ Transit PL42AC #4023 waits for an assignment inside Hoboken Terminal. Description: Pl42AC 4023 leads a westbound out of Ho-Ho-Kus. Description: Montclair-Boonton Train 6230, Denville NJT station, 1101 hours. Description: As its been since the days of the Aldene plan and the CNJ. Description: PL42AC 4023 pushing train 2312 out of Bay Head. Description: NJT PL42AC 40230 leads train 4352 into Bay Head station. Description: A whale pushing a train across the Shark River. Description: A whale PL42 pushing a Bay Head bound train across the Shark River. Description: NJT PL42AC 4023 leaving Bay Head Yard with train 4332. Description: An eastbound RVL train heads through the work zone at BROOK with 4023 pushing. Description: PL42AC 4023 leads Raritan Valley Line Train 5525 at Roselle Park station. Description: PL42AC 4023 is on the point of Train 1167. Title: mommy look, no headlights! Some one forgot to put the headlights on! Description: In my opinion, the ugliest looking engine ever! Title: could it be any uglier!! Description: Besides SD70ACes, my least favorite engine! Description: my least favorite engine!